Nearly 1,000 of L.A.’s most prominent business leaders, philanthropists and elected officials joined USC President C. L. Max Nikias and colleagues Tuesday for a festive gala celebrating the opening of USC Village. 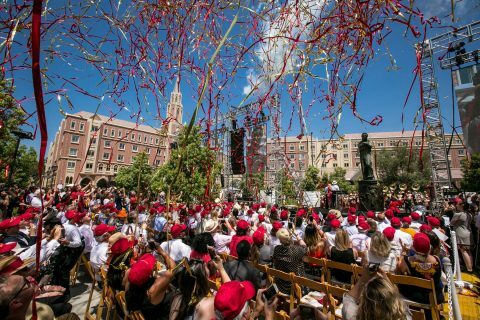 “Tonight we can see the full span of USC’s extraordinary evolution from cornerstone to capstone,” Nikias told the crowd gathered in USC Village’s Central Piazza. 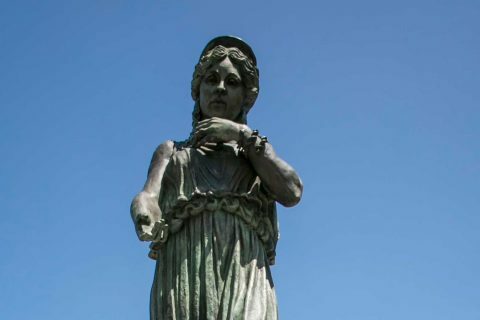 Among the attendees were most of USC’s trustees, including several whose generous gifts funded the residential colleges that are key to USC Village’s mission: David Bohnett; Charles Cale and his wife, Jessie Cale; Ray Irani; Kathleen Leavey McCarthy; and Shelly Nemirovsky and her husband, Ofer Nemirovsky. Los Angeles Mayor Eric Garcetti delivered congratulatory remarks to the crowd that included: County Supervisor Mark Ridley-Thomas and City Council members Curren Price Jr., Gilbert Cedillo and Jose Huizar, whose districts include USC’s University Park and Health Sciences campuses; and other City Council and State Assembly members. 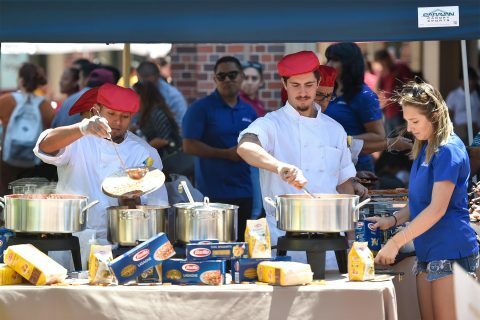 The university’s $700 million investment in USC Village — the largest development in the history of South Los Angeles — created 5,600 construction jobs and 800 permanent jobs in the project’s restaurants and shops. It brings much-needed retail options, including Target and Trader Joe’s, to the neighborhood. And it creates eight new residential colleges that immerse students in a stimulating, academically enriching environment. Highlights of the evening included music by the Trojan Marching Band and student performers from the USC School of Dramatic Arts, the USC Kaufman School of Dance and the USC Thornton School of Music. The evening concluded with a fireworks show that featured USC Village’s signature clock tower bathed in a sequence of dramatic lighting, all set to music. 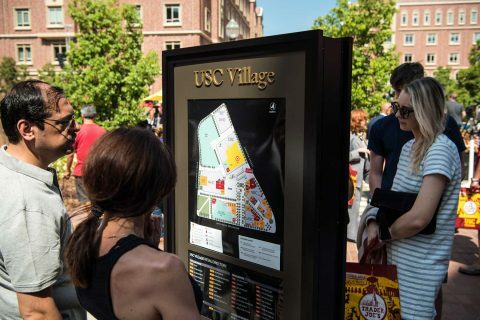 USC Village is a centerpiece of the Campaign for USC, the university’s ambitious, multiyear effort that has raised more than $6 billion since its launch in 2011. The campaign focuses on academic priorities including student scholarship, funding for faculty and research programs, and new facilities. The new development brings much-needed stores and restaurants to the neighborhood, along with hundreds of new jobs.